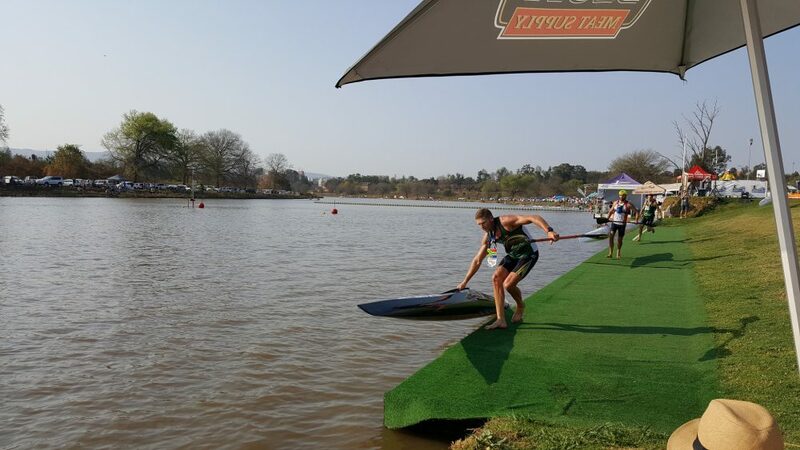 CAMPS DRIFT, PIETERMARITZBURG, KZN – Paddling in front of his home crowd, wife Pippa and young son, Thor, 39-year-old Hank McGregor (Jeep Team/Euro Steel/Gara Racing Paddles) won the K1 and K2 World double gold medals for the third time, making him a ten-time World Canoe Marathon Champion, cementing his position as the greatest marathon paddler of all time. Paddling in front of his home crowd, wife Pippa and young son, Thor, 39-year-old Hank McGregor (Jeep Team/Euro Steel/Gara Racing Paddles) won the K1 and K2 World double gold medals for the third time, making him a ten-time World Canoe Marathon Champion, cementing his position as the greatest marathon paddler of all time. The world’s best canoe marathon paddlers drew huge crowds as they took centre stage at the 2017 ICF Canoe Marathon World Championships from 7-10 September at Camps Drift in Pietermaritzburg. Having previously won six K1 and two K2 World Championship titles, McGregor was the out-and-out favourite going into the K1 and K2 Seniors event, but it’s always on the day that counts, and McGregor did not disappoint. In Saturday’s men’s K1, a lead group of four paddlers – McGregor, Andy Birkett (RSA), Adrián Boros (HUN) and José Ramalho (POR) – broke away from the main group before the first portage, and worked together to preserve their advantage. The group stayed together for the remainder of the race, without any serious attempt from anyone to take the lead until the final turn. McGregor worked himself to the front of the four-man lead group. Paddling in fine form, his strength and speed on the water kept fellow South African, Birkett, on the back of the wave as they battled it out in the 500m surge to the finish. McGregor, claiming his 7th K1 World Canoe Marathon GOLD, finished the 30km race in 02:09:37,91. Finishing half a boat length behind was Birkett with a time of 02:09:38,83. Third place went to Hungarian paddler, Adrián Boros, in a time of 02:09:39,41. For the men’s K2 race on Sunday, the stage was set for what promised to be an exciting end to the championships. South African Flatwater K2 Marathon Champs, McGregor and long-time K2 partner, Jasper Mocké, jostled heavily with six other boats from the start of the fast and furious K2 title race, where McGregor suffered a gash above the left eye from the apologetic Portuguese K2 boat. The race turned to a close-fought tactical battle between South Africa, Norway, France and Spain with the Hungarians fighting their way back into contention after dropping off the pace on the second lap. The two South African boats held the lead from the last portage through to the last turn and into the final straight, but McGregor and Mocké managed to hold the lead in the sprint for the finish, crossing the line in 02:00:10,15. Their compatriots, Andy Birkett and Jean van der Westhuyzen, were pipped by the comeback-kids, the Hungarian duo, and finished third in 02:00:11,70. Prior to this double gold, at the 2014 World Marathon Championships in Oklahoma City, USA, McGregor achieved the unprecedented record of Double World Champion by winning the K1 (singles) and then the K2 (doubles) Gold medals in consecutive days of racing over the marathon distance, with the same partner, Jasper Mocké. Hank then narrowly missed out on the double gold in 2015 at the World Championships in Hungary but still came home with the gold in the singles and a silver medal in the doubles. In 2016, and now 2017, McGregor, by taking the double gold, has become the most successful and decorated marathon paddler in the world. McGregor is also the most multi-talented and diverse athlete across all paddle-sports. Multiple World and SA Flat Water Marathon Champion, Multiple SA River Marathon Champion, Multiple SA Surfski Champion and is the currently ranked #1 World Surfski rankings. Hank has won every major river race and Surfski race in South Africa and many across the world, across all conditions. He has the record number of Berg River Marathon wins (10), a brutal race over 4 long days through the Cape winter. He has won numerous Umkomaas Marathon titles in rapids deemed to be the wildest white-water raced in conventional kayaks. And if you think he is just a good paddler, it must also be remembered that Hank has won what many consider to be a “running” race, the Dusi Marathon in both the singles and doubles categories with a host of top 10 finishes. Hank was awarded the inaugural Sportsman of the Year at the 2015 World Paddle Awards for his herculean paddling achievements. To receive this inaugural World Paddle award was the pinnacle of recognition he so richly deserved. Could McGregor get the nod for the 2017 World Paddler Award to finish off his perfect 2017 season?